UFO Roundtable Workshop » What's Under the Needle? It's time to get your UFO’s out of the closet! 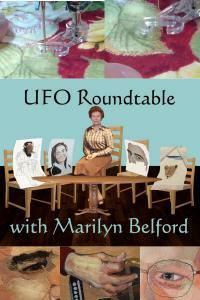 If you are a student of Marilyn Belford and you have an unfinished class project because you just didn't get time to complete it or became stuck, then now is the time to join Marilyn's newest class "UFO Roundtable with Marilyn Belford". This new course runs for 10 weeks starting soon and will give you enough time to complete your projects. There are no structural lessons but there will be a full forum for posting your photos, questions, and comments with plenty of good discussion and advice. Learn from what others are creating as well as Marilyn as she focuses on one to one learning with you, helping you successfully complete your work. You can find out more about this class by visiting our Academy: "UFO Roundtable with Marilyn Belford"